We’ve featured Black Uhuru before. Go here and here to read the previous write-ups that give a good bit of background information. This mixtape is not a greatest hits or a proper retrospective. I’m only focusing on three releases: Chill Out, Dub Factor (which is a dub version of Chill Out), and the four-CD special edition of their major album, Anthem. I’ve paired five Chill Out tracks with their dub siblings. And the Anthem tracks are taken from all four of the CDs in the special edition. In case you are wondering, yes, the four CD-set is worth the investment. Much of the music simply was not previously available. In fact, the original Anthem album is augmented by including the full-length tracks, some of which were edited down for the original release. The second and third CDs are remixes for UK and USA markets respectively. The fourth CD is a Sly and Robbie dub that was previously unreleased. If you’re into Black Uhuru, you will be delighted by the cornucopia of music contained in the special edition. All of the music on this mixtape is from the second incarnation, and most importantly, incarnation of Black Uhuru that featured Michael Rose on lead vocals with founding member Dukie Simpson and (Sandra) Puma Jones on backing vocals, plus bassist Robbie Shakespeare and percussionist Sly Dunbar holding down the rhythm section. When I was putting this Mixtape together, I was struck by a paradox. 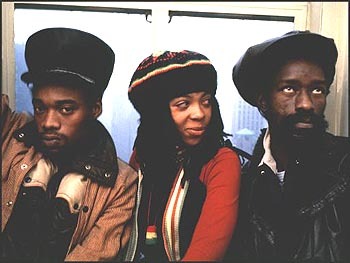 Black Uhuru is often considered the last of the great roots reggae aggregations and yet their music was far from roots in that it was decidedly electronic rather than acoustic oriented. Indeed, much of their music from this period prefigures the use of electronics not just in reggae but in popular music in general. The voices are strictly roots but the instruments are on some other vibe, and it is this odd coupling that accounts for the seminal importance of Black Uhuru. They were showing the way ahead while flying the flag of tradition. Their music is a heady mix that grabs you and doesn’t let go. Anthem was the first reggae album to win a Grammy. At least half the tracks from that album are genuinely considered reggae classics. And yet, not too long after the album’s success, this formation broke up. Although the vocal frontline was reformed, Black Uhuru did not achieve that level of sublimity that the Rose/Jones/Simpson frontline mastered. Folks have their favourites: some favor the song-writing of Dukie; others are entranced by the grit of lead vocalist Michael Rose; and there remains a core of us who are convinced that Puma’s harmonies are surely what distinguished Black Uhuru. I think undoubtedly the unique mix of voices was a major ingredient in the overall Black Uhuru sound but to focus on the voices and overlook the instrumentation and production of the Sly&Robbie Taxi duo, as they came to be known, is a mistake. I believe that not just their musicianship but also the forward-visioned production values that Sly&Robbie contributed set Black Uhuru apart from any other reggae group. They produced music that was truly greater than the sum of its parts. I remember seeing this aggregation performing on a riverboat; when the formal set was finished and the vocalists had left the stage, Sly and Robbie just kept on playing, jamming hard. None of the audience left. Shortly after, the singers came back on and the band played on. Perhaps, moving in two directions at one time was just too much of a contradiction regardless of the popular success. Sometimes it’s like that. Some want to stop. Some want to go on. Eventually the center cannot hold and as Yeats famously noted: things fall apart. But, oh, while they were together what a wild and wonderful sound that was. After Marley transitioned there was only one great reggae ensemble that pushed the music forward with the same ardor, artistry and relevance as Marley evidenced—that band was Black Uhuru.